Sometimes a person just needs the simple comfort of a warm mug of tea. And so I'll keep it simple: Here are two of my favorite herbal teas (tisanes, really) that are easy to make and lovely to drink. I hope you'll try them for yourself! 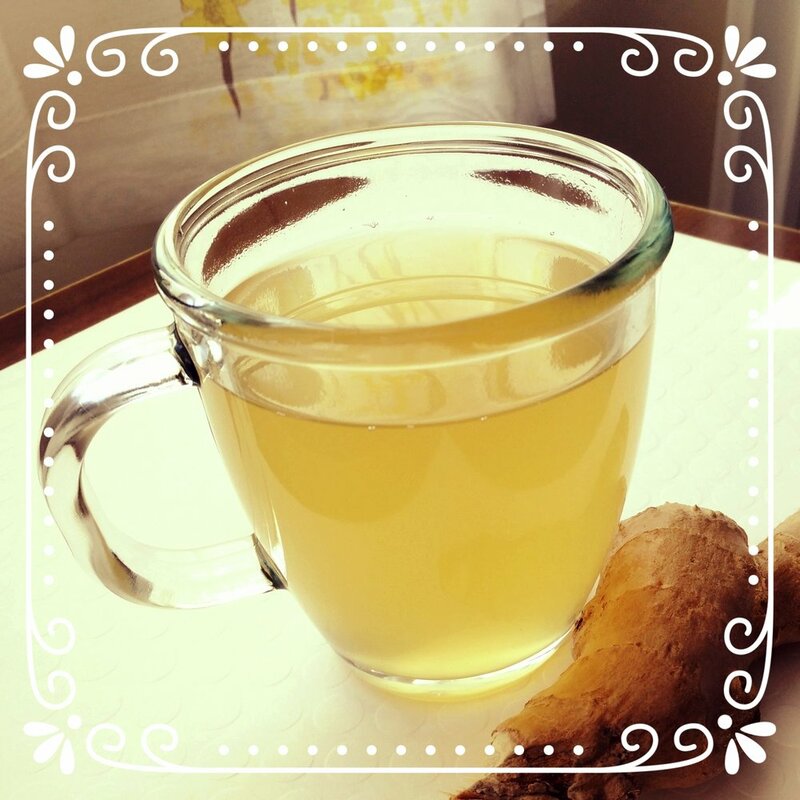 Homemade ginger tea (4 servings): This one is perfect for chilly, gray days since the ginger is so warming and invigorating. It's also a helpful remedy for belly troubles, which is the main reason I started making it. Two to three cups a day really makes a difference! To brew it, I use a one-quart mason jar and this mesh infuser, although you can always just strain out the ginger bits after you've steeped them for the required time if you don't have an infuser. The nice thing about the mesh strainer is that it keeps any bits of peel I missed out of the tea. Feel free to adjust the lime and sweetener to your taste. This will keep in the fridge for several days and can be consumed hot or cold, although I prefer it hot (at least during this time of year). Place the ginger pieces in a mason jar, teapot, or whatever vessel you want to use for brewing. Pour the boiling water over the ginger and allow it to steep for 10-15 minutes. Remove the strainer or pour the tea through a sieve to remove the ginger pieces. Add sweetener of your choice and lime juice; stir gently. Solace tea (Several dozen servings): This blend is based on the Comforting Tea that's sometimes served at Aveda salons, although it's WAY less expensive per cup. I like to give credit where credit is due, but I've been making this tea so long that I can't even remember where I found the original recipe. Some of the ingredients can be tough to find, admittedly, but your best bet is either an online retailer or the bulk spices section of a grocery store like Whole Foods. The herbs are expensive by the pound, but you won't be buying close to a pound of any one item. 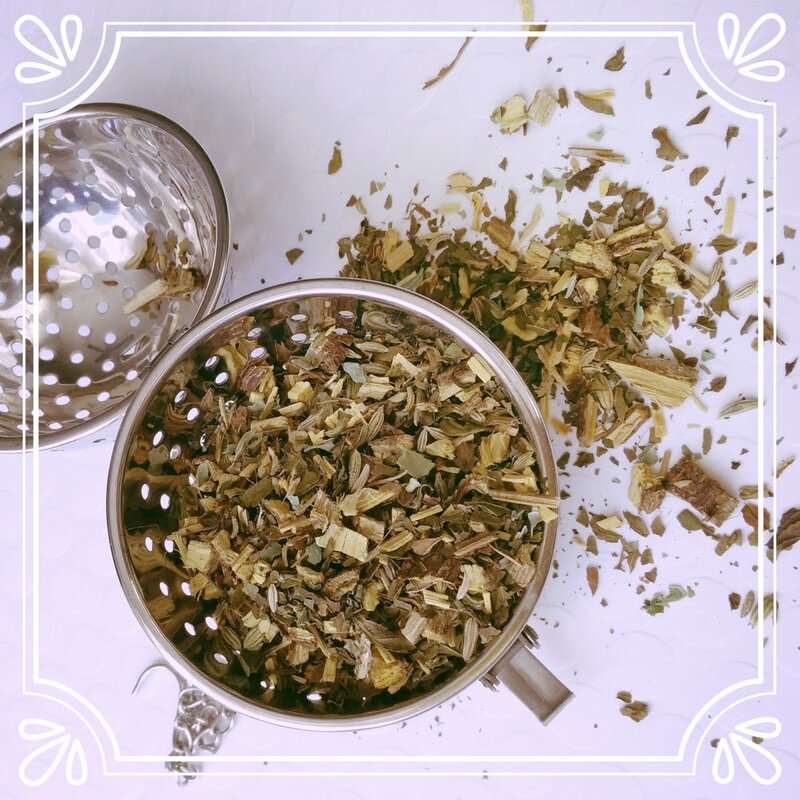 This tea is probably my all-time favorite herbal tisane; the licorice root is deliciously smooth, and the fennel, mint, and basil smell so gorgeous and fresh. By the way, if you're not a licorice candy fan, don't worry! This doesn't taste like black licorice at all. It's herbal and naturally sweet and unbelievably silky. It's great for irritated throats and those "blah" days that make you want to stay in bed. It's one of my favorite things ever, and I keep a jar of it in the cabinet year-round. Mix all ingredients in an airtight storage container. To make the tea, heat water to about 180°, or close to boiling but not quite there. (It's a forgiving method, so don't feel like you have to be super exact.) Measure out 1/2 Tbsp of the tea mixture and place it in a strainer or paper filter bag. When the water is hot, pour it over the tea mixture; steep for 5-7 minutes. Sweeten if desired, although it's pretty sweet on its own! Add the vodka, brandy, and cranberry juice cocktail to a shaker and mix. Pour over ice, top with ginger ale if desired, and add an orange wedge and cloves. As luck would have it, I discovered Gina C.'s recipe for crockpot chai concentrate a couple weeks ago, and I've been hooked ever since. As long as you've got a crockpot (I suppose you could just make it on the stovetop too), access to bulk-bin spices, and a one-quart container, you can have tasty, cheap chai any day of the week! Add everything except the teabags to the bowl of a slow cooker. Cover and turn on high. After three hours, add in the teabags, steep for 10 minutes, and then squeeze the teabags well to drain. Pour the concentrate through a fine strainer to remove all the spice solids. Once it's cooled, store the strained concentrate in a one-quart container in the fridge until you're ready to use it. For each serving, mix equal parts chai concentrate and milk of your choice. Heat in the microwave (or pour over ice, if you prefer). This recipe doubles as an air freshener! I have a batch simmering in the kitchen right now, and the whole apartment smells amazing. What I love best about the recipe is its adaptability. If you don't like an ingredient, you can leave it out, or you can increase the amount of the spices you love. You could also add in other ingredients frequently found in chai, such as star anise, fennel seeds, or allspice berries. You could make orange-flavored chai by throwing in some dried orange peels, or you could make chocolate chai by adding some cocoa powder. You can make it less sweet or more sweet, depending on what you like, or you could even leave out the honey and just sweeten each individual serving as you make it. If you want this to be vegan, you can substitute the honey for a different sweetener and use almond milk or soy milk to make your lattes. P.S. I think the way I make it tastes closest to Tazo's organic boxed concentrate because of the amount of cloves I use. Looking for a way to use up some basil or rosemary? Try a cocktail!